Monitor location-based social media to identify and mitigate risk related to specific geographies and places. Location monitor enables you to define key geographic locations, monitor multiple locations simultaneously, screen native geo-tagged and geo-inferred social media content for risk, and delineate social media coverage by location. Many organizations struggle with the need to identify and mitigate risk related to specific geographies. 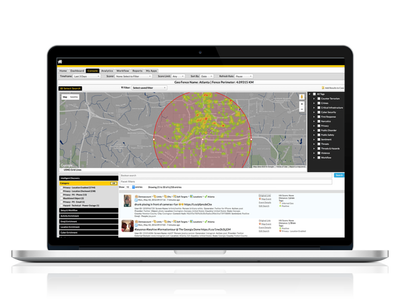 Location-based social media channels provide the opportunity to detect localized threats and enable you to take action to mitigate risk to the people, property and the site. Monitor Twitter, Instagram and other sources with user defined geo-fences in real-time. AI-driven threat detection automatically illuminates high risk situations. Automatically detect privacy exposures, physical threats and breaking events. Search and filter with intuitive tools easy enough for non-technical use. DigitalStakeout Location Monitor is subject to use-case approval per each supported data provider. Government subscribers are subject to DigitalStakeout responsible use controls.